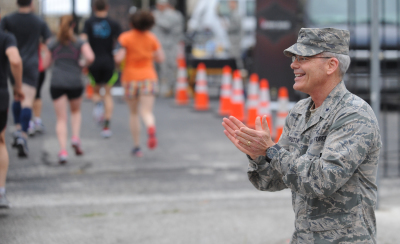 Since the inaugural year of the Alamo Run Fest in 2013 we have included special military sub-division awards for the top three active duty military men and women finishers in each of the Alamo Half, Alamo 10,000 and Alamo 5K events. 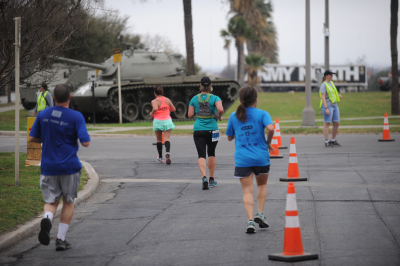 In 2016 we enhanced opportunities for our military participants to really 'show their stuff' and challenge other military units by adding the Military Team Challenge as part of the Alamo Half marathon event. 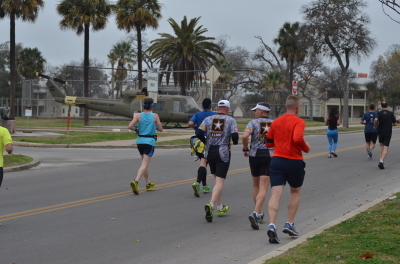 The Alamo Half includes a Military Team Challenge with six different categories to compete not only for ‘bragging rights’ but also for the ‘Armed Forces Challenge Cup’ award in each category. 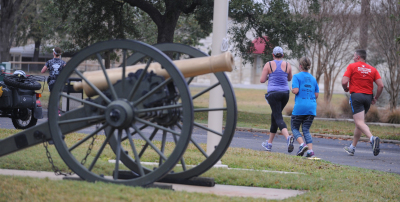 We encourage active duty military participants in the Alamo Half, in all service branches, to take the challenge, form a team and then challenge others to take you on! Individual military team participants are still eligible for the other individual military sub-division awards and age group and overall event awards. 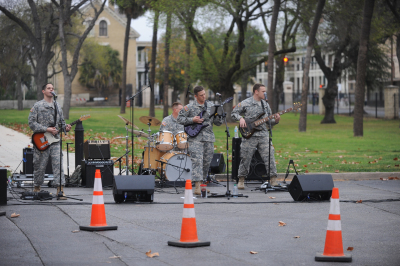 The Military Team Challenge is limited to participants entered in the Alamo Half marathon event. See Instructions BELOW for setting up or joining a Military Team. their dependents receive a 20% discount on entry to the Alamo Run Fest Events. The Alamo Run Fest takes place in San Antonio, often referred to as ‘Military City USA’. We felt it especially fitting then to create a special award that helps celebrate the important role that the military (and Joint Base San Antonio) play in what makes San Antonio such a special place to live. The Annual Warriors Challenge will become an extension of the event’s recognition of active duty participants in some of our other awards categories, and also include those who have served in the United States Military, choosing to fight for the rights and freedoms that we enjoy as citizens of the United States. The Warriors Challenge Award will be awarded annually to the military service branch that registers the most participants to include active duty, retired and former military personnel, in the Alamo Half, Alamo 10,000 and the Alamo 5K events combined. The inaugural Warriors Challenge Award went to the U.S. Army for having the most participants in the 2016 Alamo Run Fest! The U.S. Army repeated again with the most registrants in 2017, even though dangerous weather caused cancellation of the event on race morning. So now it's 'game on'. Will the Army 'three-peat' or will another service branch step up to break Army's winning streak and claim the 2018 Warriors Challenge Title? • Active Duty Men* - Male U.S. service members from the same duty station, installation, division, center or group. • Active Duty Women* - Female U.S. service members from the same duty station, installation, division, center or group. • Active Duty Mixed* - Men and Women U.S. service members from the same duty station, installation, division, center or group. At least one scoring runner must be from the opposite gender. 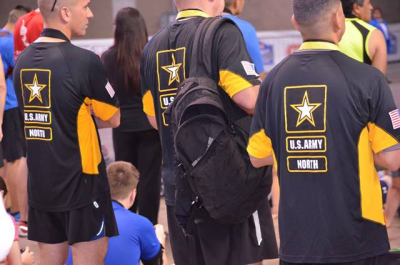 • Active Duty Mixed Masters* - Men and women U.S. service members age 40 or older from the same duty station, installation, division, center or group. At least one scoring runner must be from the opposite gender. • College/University ROTC Teams - Men* - Men currently enrolled in ROTC and at the same college/university. • College/University ROTC Teams - Women* - Women currently enrolled in ROTC and at the same college/university. Note - ROTC Instructors are not eligible team members on ROTC teams. ROTC team members will be provided a 25% entry discount provided the team captain or instructor emails us at: [email protected] to request an ROTC team discount code prior to entering. Each team must have a minimum of four and maximum of eight team members. Mixed teams are required to have at least one male and one female team member, with the remaining team members filled out to meet the minimum of four and maximum of eight guidelines. Only the 4 fastest times will be used for scoring the teams. For the mixed teams, at least one scoring runner must be from the opposite gender. All active military participants – on a team or not - are still eligible for individual top awards. As noted earlier, the Alamo Half marathon is the only event within the Alamo Run Fest that will have a Military Team division. Within each of the six team categories listed above, teams can be made up of U.S. service members from the same duty station, installation, division, center or group. Minimum of four and maximum of eight per team. Mixed teams must have a minimum of one scoring runner from the opposite gender. During online registration for the Alamo Half marathon, after you've entered your personal information, you'll see the option to 'Join Part of a Team/Group'. You'll then be provided the option to 'Select Existing Part of a Team/Group?' If you are looking to form a team, then as the team 'captain' YOU should register first and set up the team with a name and a password. Be sure you've determined which of the six categories you will be setting up a team for, as listed in the choices (same as list above)... Active Duty Men, Active Duty Women, Active Duty Mixed, Active Duty Masters Mixed, College ROTC Men and College ROTC Women. Once the Team Captain has set up the 'Team' and completed their own registration, you should then pass along the team name and password to other team members who can then go online and register for your team. During their registration process they can find your team and use the password you've provided them so they can join your team, and then complete the event registration process. Be sure to follow up with your teammates to make sure they have entered the event and joined your team. Remind them also that the earlier they enter, the lower the entry fees! Once you've set your team up, it's time to 'throw down the gauntlet" and challenge other units to join you at the starting line to see who will take home the bragging rights that go along with winning the inaugural Alamo Half Armed Forces Challenge Cup awards!